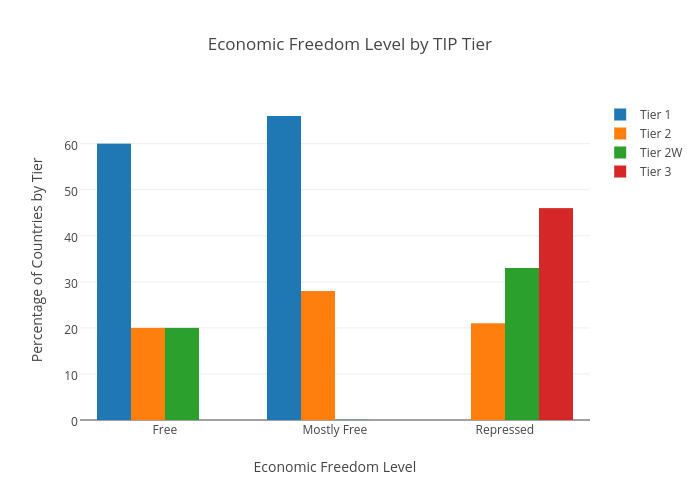 Samplank's interactive graph and data of "Economic Freedom Level by TIP Tier" is a grouped bar chart, showing Tier 1, Tier 2, Tier 2W, Tier 3; with Economic Freedom Level in the x-axis and Percentage of Countries by Tier in the y-axis.. The x-axis shows values from -0.5 to 2.5. The y-axis shows values from 0 to 69.47368421052632.